Picking up right where we left off yesterday, here are my top five shows of the year. Phish’s second Halloween cover set since they’ve comeback turned into one of their best. Transforming Atlantic City’s historic Boardwalk Hall into a retro-’70s dance party, Phish nailed Little Feat’s Waiting For Columbus, in a selection that few saw coming. For the first time ever, Phish interpreted a live album, a choice that provided a more upbeat and engaging feel to the Halloween set than some of the former studio albums. With a guest horn section and virtuoso percussionist, Giovanni Hidalgo, Phish recreated the music of a Little Feat, one of the band’s primary influences with blues-based funk grooves and quick-witted musical exchanges. One of the experiential highlights of 2010 for almost all who were there, this set could land this show on this list by itself, but there was more! 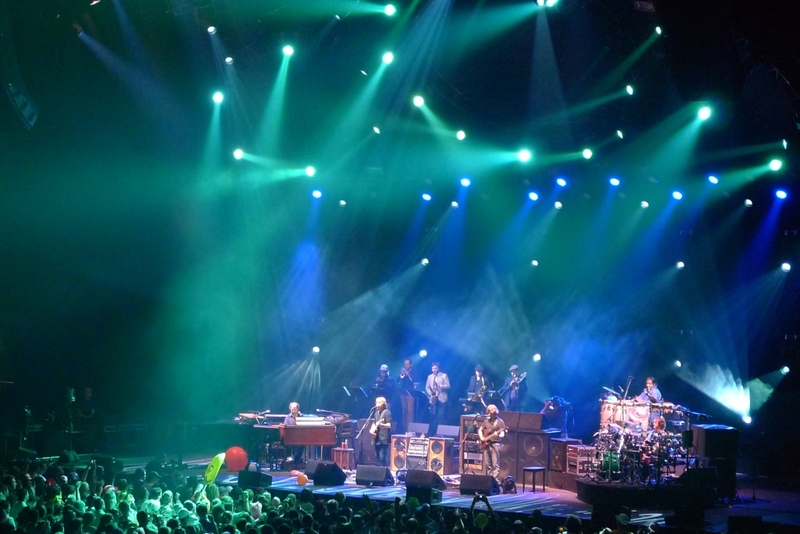 The most impressive “Stash” of 2010 and a holiday-themed combo of “Ghost > Spooky” highlighted the first set, while a celebratory third frame centered on a smoking “Jibboo” that segued into “Camel Walk,” and included several Phish anthems. All in all, this three-set fall finale delivered in full. 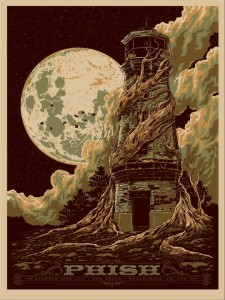 This flowing two-setter featured sharp whole band jamming, blistering work by Trey, and one of the jams of the year in “Disease > What’s The Use?” In this show that never stopped, Phish brought huge doses of fire-laced playing, particularly in the second set, while also including a swank mid-“Mike’s Groove” stop in “Sneakin’ Sally.” The entire band clicked from the get go on this night, and never stumbled en route a classic Alpine show that brought summer tour to a final peak. “Tube” opened up and strong versions of “Reba”‘ and “Antelope” popped within a first frame with no real lulls. Transformed to DVD in record time, Phish, themselves, have already given a nod to this night as one of their favorites. If the Alpine’s summer showcase represented a top-shelf Phish rock concert, The Greek’s third night was akin to a symphony. Peaking their three-show stand with delicate and inspired creativity, Phish capped the run with, in my opinion, the best set of summer. Kicking off with “Wilson” and fusing into my pick for jam of the summer–an exploratory “Light” that found pure gold—the band then came back from the stratosphere via “Twenty Years Later.” Phish showcased an impeccable mid-set “Harry Hood” and closed the show with the combination of “2001,” a rendition of “Suzy” that actually packed a punch with a smoking reprise jam, and a patiently sculpted “Slave” that fit congruently with its surroundings. Playing more fluidly than they had all summer, this show was underlined by the band’s ego-less interplay. Daytime high-points came in soaring versions of “Jibboo” and “Reba,” and a “46 Days > Tube” combo that lit up the end of the first set. Right before Phish’s three-night Halloween weekend in Atlantic City, they dropped a mid-week bomb in New Hampshire that trumped any one of them. Comprising the first set entirely of songs unplayed on fall tour (other than “Curtain (With)” and “It’s Ice”), Phish brought out “After Midnight” for the first time since Big Cypress, “Alumni Blues,” “A Song I Heard the Ocean Sing,” and “Walls of the Cave,” among others. And after setbreak, the band played one of their most impressive top-to-bottom stanzas of the year. After a bizarrely-placed “Possum” opened up, Phish dove into one of the elite “Lights” of fall. Illustrating the late-year, groove-based direction of the song, this tightly-woven excursion found its way back through “Alumni’s” funk patterns en route to one of fall’s brightest highlights. And as soon as “Light’s” psychedelic roller coaster ended, perhaps, the “Mike’s Groove” of the year began. With the reggae stylings of “Makisupa > Night Nurse > Makisupa” sliding out of “Simple,” and the best “Ghost” of fall dripping artistically into “Mango Song,” this musical sequence had a little bit of everything. Bringing the set to a head in a wild “Weekapaug” that included a staple jam on The Rolling Stones’ “Can’t You Hear Me Knockin,” Trey lyrically reprised several of the set’s songs over the break-neck music. Almost bursting at the seams, Phish flew from “Weekapaug” into a “Llama Reprise” to end the set in shredding and energetic fashion. On October 20, in Utica, New York, Phish played their best two set show of this era—plain and simple. 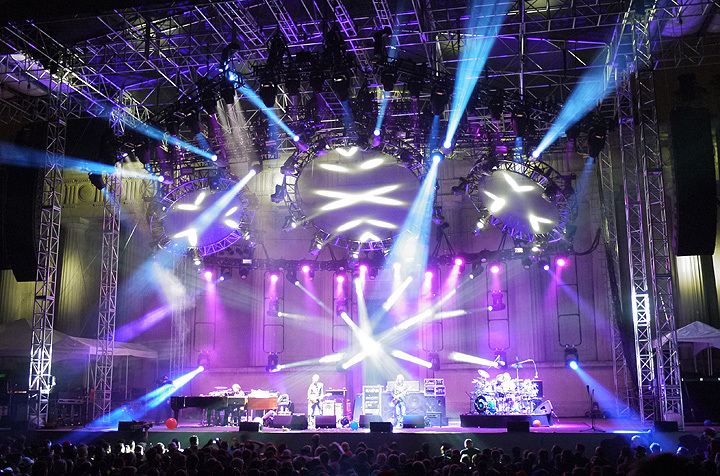 In recent times, a show with one outstanding set can be a tour highlight, and Phish’s mid-week stop in Utica featured two jaw-dropping halves of music. Fusing their improvisational playfulness of old with their musicianship of now, Phish twisted and turned through two frames of musical adventure. After taking part in a rite firmly planted in the moment, while looking towards both the past and the future, when the lights came on after this one, everyone stood wide-eyed and disoriented as if waking from a dream. 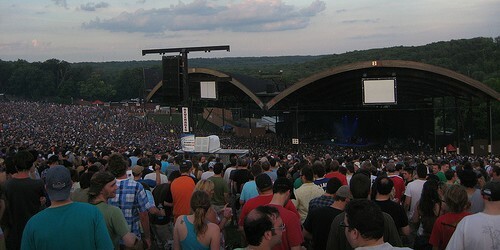 You could tell from the looks on people’s faces that Phish had just played the show of the year. As soon as the band tore apart a third-song “Vultures,” the dial was set for eleven and was never turned down. “Wolfman’s > Cities,” “David Bowie,” “McGrupp,” “Saw It Again,” and the best “Anetlope” in eons—all laced with the theme of “Guyute”—quickly turned into a face-melting first set. The energy in the building was abuzz, and everyone seemed to be aware that we sat amidst a retro-throw down like none other. Everything the band touched turned to gold on this night, and the second set peaked with one of the most sublime sequences of 2010—”Split > Have Mercy > Piper > Split—with a “Birds” reprise in “Piper.” Flowing organically and with top-shelf communication, Phish darted and dashed their way around a show laced with their signature wizardry. 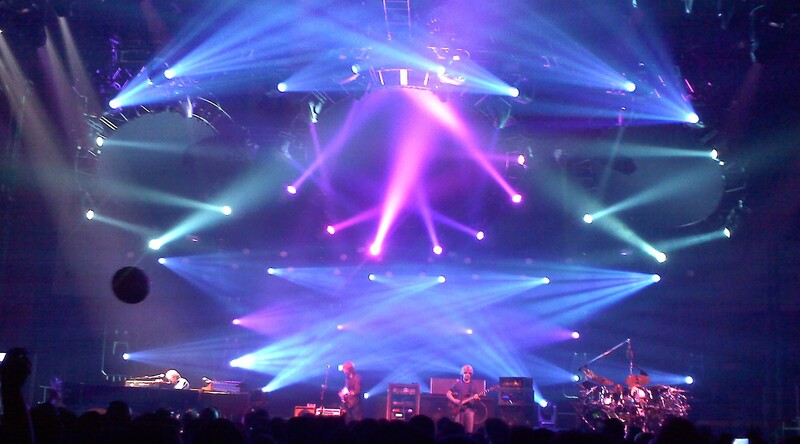 Throw in one of the most blissful open jams of the year out of “Have Mercy” and you’ve got the recipe for the best Phish show of 2010. 10.19, Augusta, ME: Though boasting two of fall tour’s top-tier jams in “Light” and an off-the-charts “Reba” for the ages, the entire show didn’t have enough consistency or flow to make the top ten. 8.6, The Greek: Though each set featured two outstanding in jams (“Bathtub Gin” / “Cities” and “Rock and Roll” / “Simple”) the band had yet to put it all together like the did the following night. 10.22, Providence, RI: A strong second set kicked off with one of fall’s best jam sequences in “Rock and Roll > Carini,” but there wasn’t much to speak of in the first. 10.30 Atlantic City, NJ: I’m only putting this here because I’ll get too much flak if I don’t. “Tweezer > Led Zeppelin > Whatever.” But “2001 > Bowie” contains some of the most scintillating playing of the season. Tack on a strong first set and a fun-filled rock show emerges. A taste of the just-released Kevorkian remasters courtesy of Live Phish. DOWNLOAD OF THE DAY: Will be back tomorrow! This entry was posted	on Wednesday, January 19th, 2011 at 2:02 am	and is filed under Uncategorized. You can follow any responses to this entry through the RSS 2.0 feed. Both comments and pings are currently closed. @gus Yes! Exactly my thoughts when I heard it. Posted a few days back that the MSG Sand was “Island Tour-esque.” Precisely what I meant. Also… Your Hood is dope! Keep up the good work, my man. the irish people are pretty funky too? first time here and I just wanted to stop by and say hi everyone.